We’re pretty deep into the season at this point. The kids are back in school. The “official” end of summer, Labor Day Weekend, is upon us. Setting aside the Cortez/Tanner bluefin bite in January and February (which felt more like the end of 2014), we’ve been catching tuna now since May. Three solid months of pelagics and it just keeps going. The scene is changing though. For one thing, it’s very up and down. One day the boats are all limiting out. We all get excited. “Oh yeah, it’s really getting going now!” Then the next day the bite falls flat on its face. Offshore fishing is always a high risk/high reward scenario, but this season lacks consistency. The weekend bite did get a nice shot in the arm though with the arrival of some better bait this week in the San Diego bait receivers. A lot of it is that nicer 4-6” candy bar size. Hopefully, that trend continues. In terms of the fish, the early season bluefin seem to have mostly either moved north or out. The good news is the reports of exotics (well, more exotic than yellowtail, YFT and BFT) being caught here and there. We had our first confirmed wahoo caught over the weekend. Short billed spearfish are popping up. At right, angler Eric McIntire displays his short bill caught aboard the Pacific Star on Friday. Also, there’s a lot of marlin around and I’ll talk more about that on Friday. 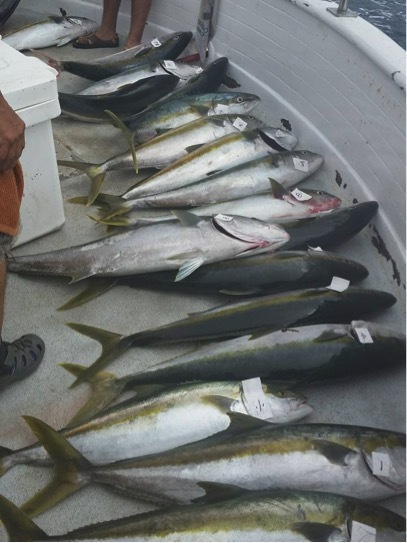 The yellowfin being caught are a wild mix in terms of grade. There’s bigger fish everywhere, but most of the larger grade fish seem to be concentrated north of Clemente. The local fish getting caught at overnight and shorter range trips from the San Diego landings are mostly the smaller grade football-sized fish. What they lack in size though, they’re making up in numbers with many boats registering limits over the weekend. The big news is that the dorado have made a showing. Great numbers of dodos are being posted in the counts and the grade of fish is very nice. 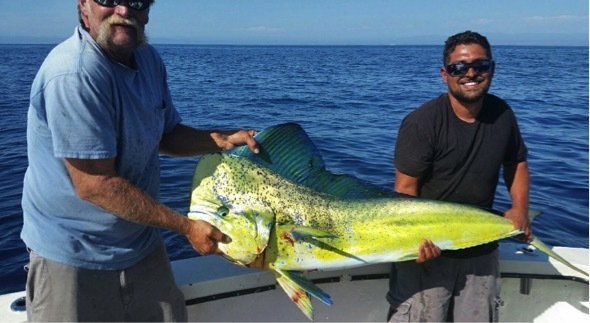 There was a beautiful 39-pound bull caught on the San Diego last week. The whopper of the week though was a HUGE 58.3-pound fish caught by commercial fisherman, Robbie Mailat of Oceanside (pictured above). 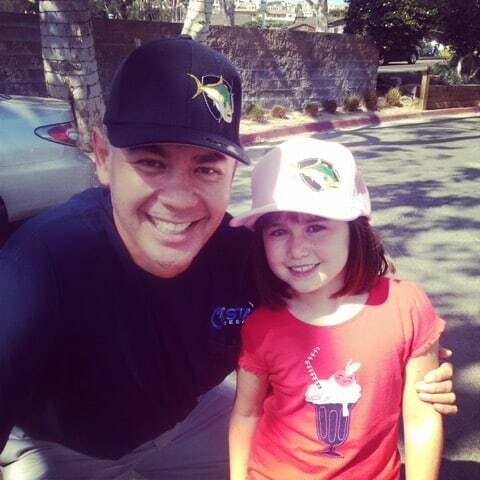 I talked to a fishing buddy of mine down in Cabo over the weekend. He was complaining that most of the dorado down his way were of the necktie variety. I told him we’d return MOST of the big fish after El Nino. To round things out, yellowtail are biting everywhere. Nobody is really fishing the Coronados right now, but the local boats in San Diego are getting their fill along with your standard summer fare of bass, bonito and barracuda close to home. The bite continues north…both along the coast and out at the islands. It extends all the way into the 805. 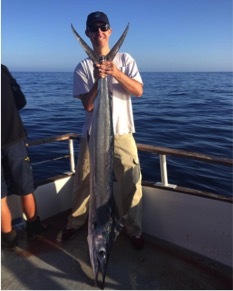 The County Line bite seems to have taken a breather, but there is a still a volume of fish around the Oxnard/Ventura area that can be had at 1/2 and ¾ day range. The shot below is from ¾ day boat the Gentleman out of Channel Islands Sportfishing on Monday. It’s really good right now and there is really no excuse not to get out and enjoy it.